One of my favorite things is opening up my cupboard doors and loving what I see. I like seeing and knowing where all of my kitchen things are and having systems in place to keep it that way. How do I do this my friends? Tools. And Systems. Tools and systems. First lets talk about systems. When I say “systems” what I mean is a way of keeping that space organized easily and effectively. 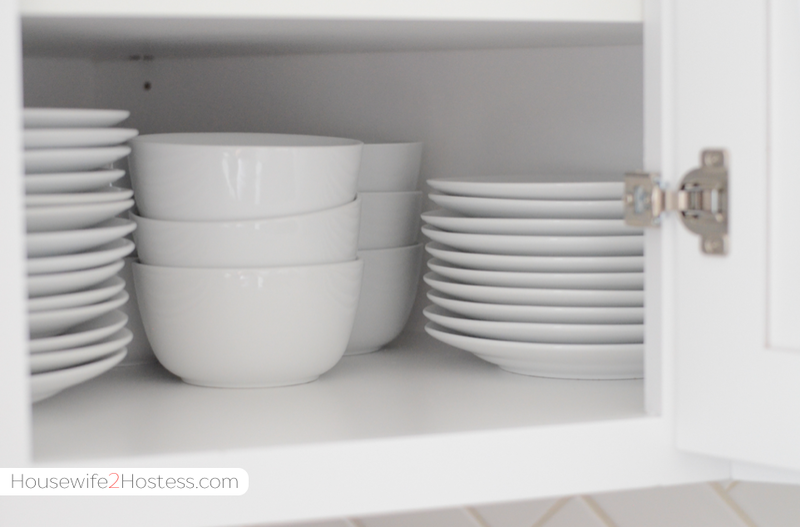 Example: My system for storing plates and bowls. I bought all of the same sized dishes to make it easier to store and get what you want without having to ever pull from the middle. This way when the dishes are used, washed and needing to be put away I (or anyone for that matter) can put them back no fuss. 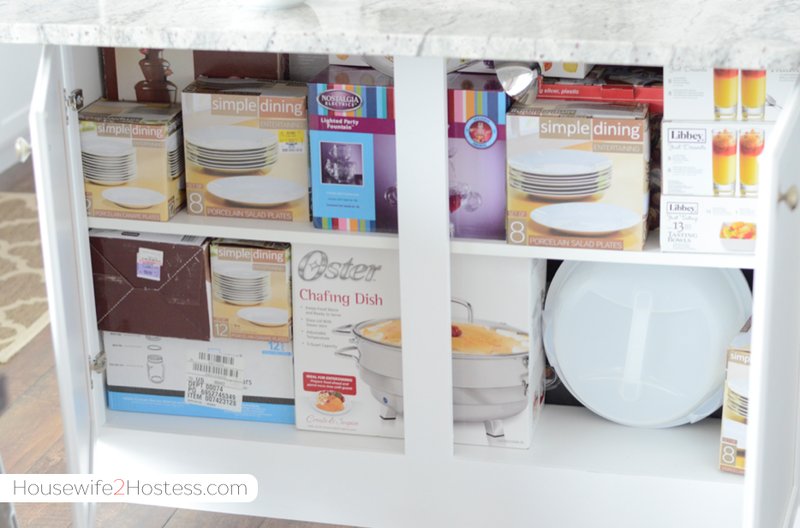 See how I’ve done the same thing with the same thing on the square dishes on top? Even though this is an awkward corner cabinet, I don’t have to ever pull from the back unless I’ve used that many bowls up. Genius right? Lets talk about the power of tools. Tools would include things that make the system more functional. 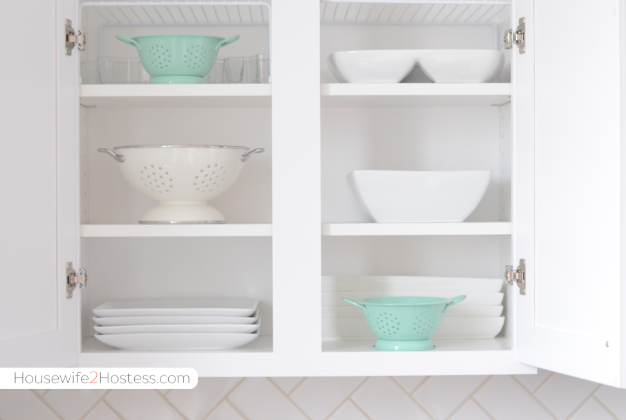 A good example of a tool to enhance a system is a silverware organizer. Ah ha moment? Yes! 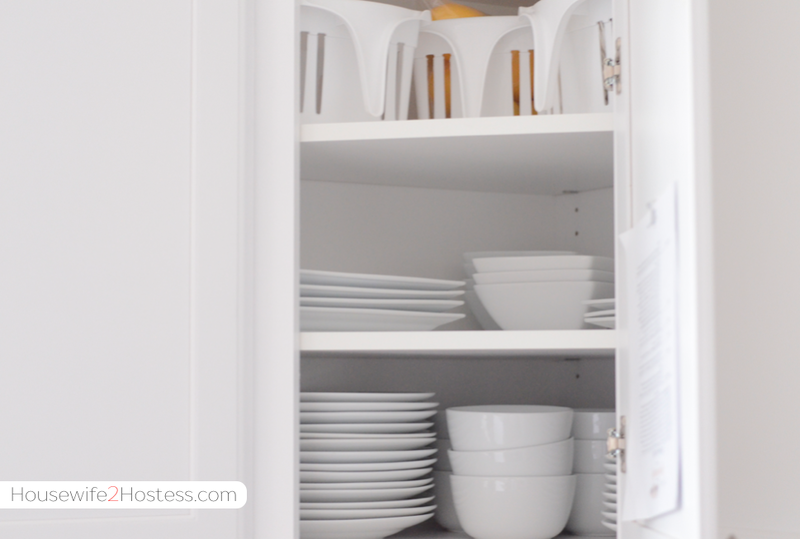 Here is the lower corner cabinet where I’ve used a lid holder to store my lids vertically. 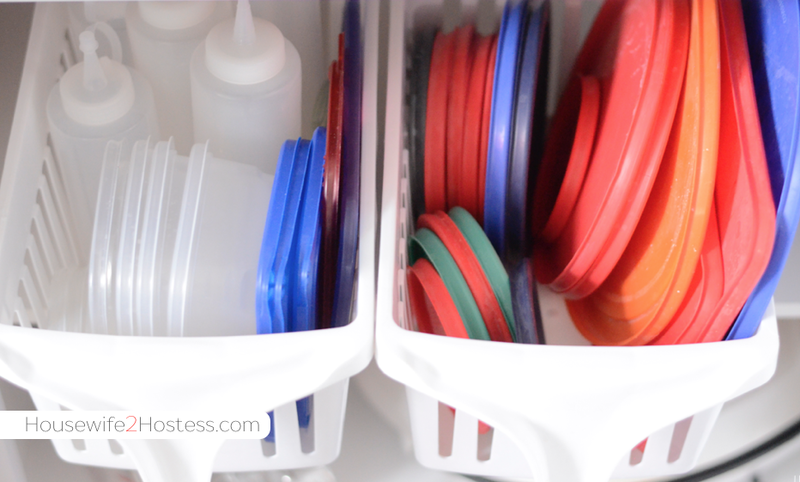 This is such an easy way to keep them separate, as I really don’t use lids on a daily basis. Then I nest a few pots and pans, keeping the most frequently used on top. For the spices and medicines I use a lazy susan. Sure, some might argue that I’m not maximizing the space in the corners, but this method keeps this space nicer and neater than any other system I’ve used. 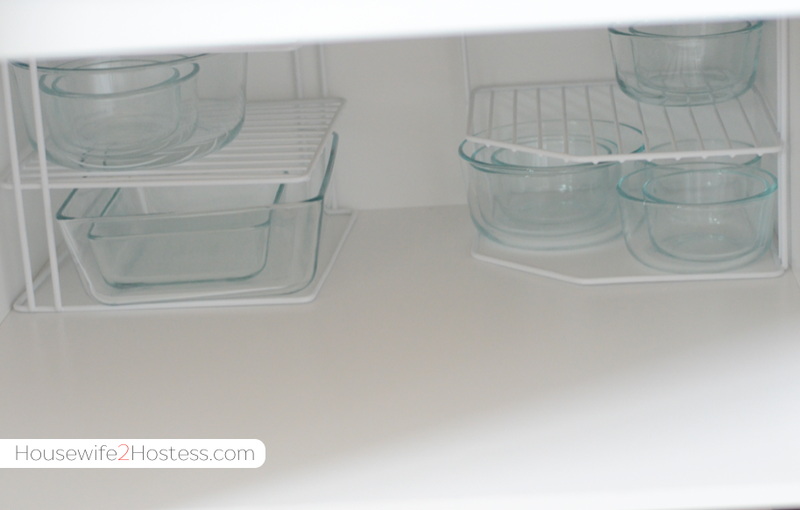 Storing tupperware and pyrex has always been messy for me. Then I discovered stacked wire shelves and small handled baskets. 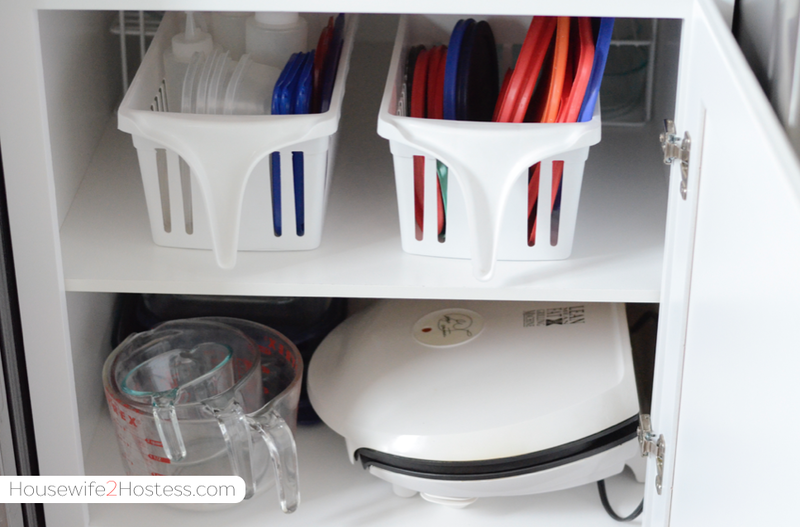 The baskets in front hold all of the lids and the stacked wire shelved hold one set of nesting pyrex. So I do have to pull the baskets out whenever I need one, but for me it was easier to do that than dig through piles of lids nested in the bowls. I store my mixer and hand mixer in the same cupboard as the mixing bowls. When we finish our basement some of the party items including chargers and cake stands will go into the storage room. 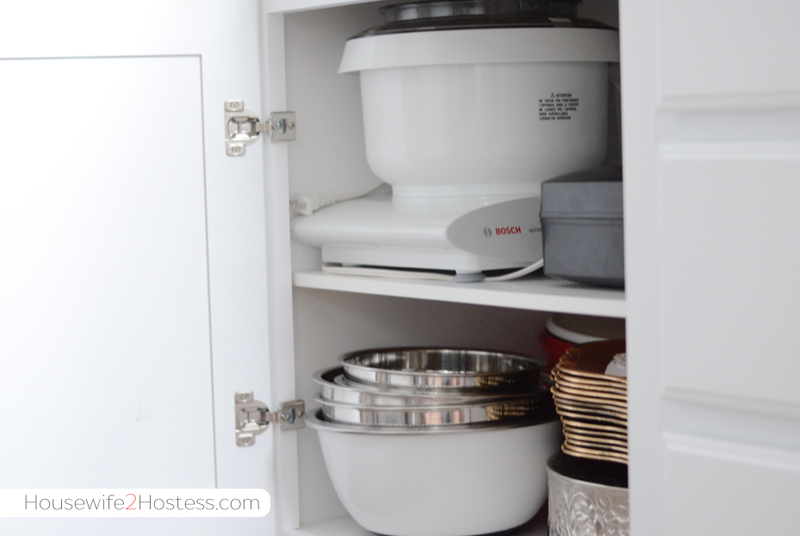 Then I won’t nest as many bowls, which will make it easier to use and store. For those things I rarely use, I have them arranged tetris-style under the kitchen island. It works fine because those items come out twice a year if that. But is definitely not a good system, or easy to maintain. What systems are working (not working for you)?